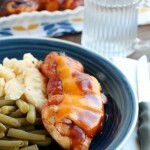 Southwestern Chicken Packets (+ Video!) - Dessert Now, Dinner Later! 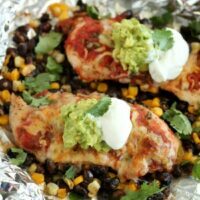 These Southwestern Chicken Packets are an easy and delicious tin-foil dinner recipe you can cook with a fire (while camping), on a grill, or in an oven. 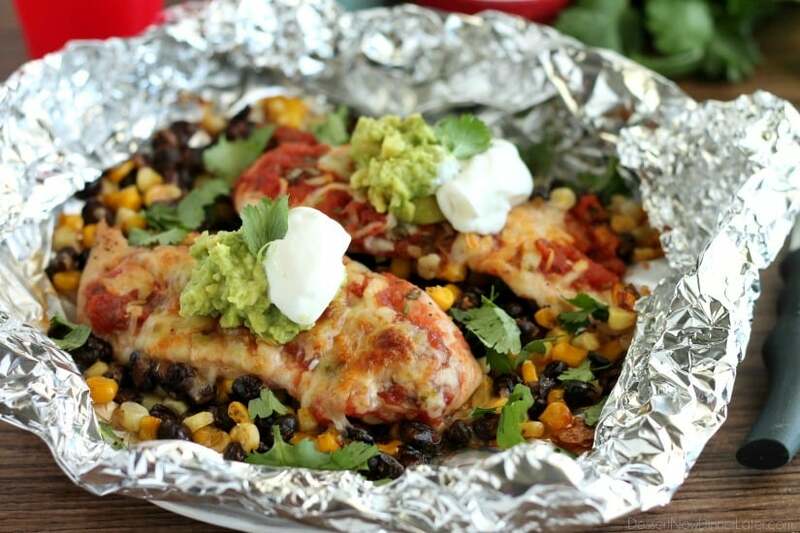 I’m way excited to share this Southwestern Chicken Packets recipe with you today! 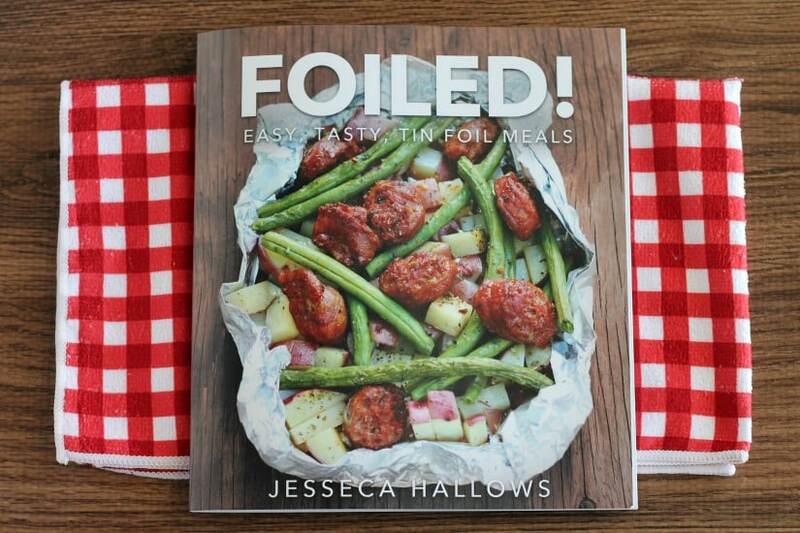 Not only is it flipping delicious, but I get to tell you all about my friend Jesseca’s new cookbook FOILED! that’s completely devoted to camping recipes. Plus, I’ve teamed up with some bloggers to give away some wicked awesome summer swag! My friend Jesseca blogs at One Sweet Appetite and if it wasn’t for her, my photography would be nowhere near where it is today. One day a couple of years ago, Jesseca offered to let me come to her house and watch her work. I hardly knew her at the time. We had chatted a little bit online and briefly met once in person at that point in time, but I went anyway because I loved her photography and wanted to learn. I’m so glad I did! Jesseca is the NICEST person you will ever meet, and even though she doesn’t think she helped me very much that day, I have been improving leaps and bounds from how I used to photograph things with my point-and-shoot camera back in the day. I’m so grateful for her! Photographing food is one thing, but photographing tin-foil meals, is another! It’s hard guys! This post was tricky for me. Jesseca makes it look so easy in her book FOILED! 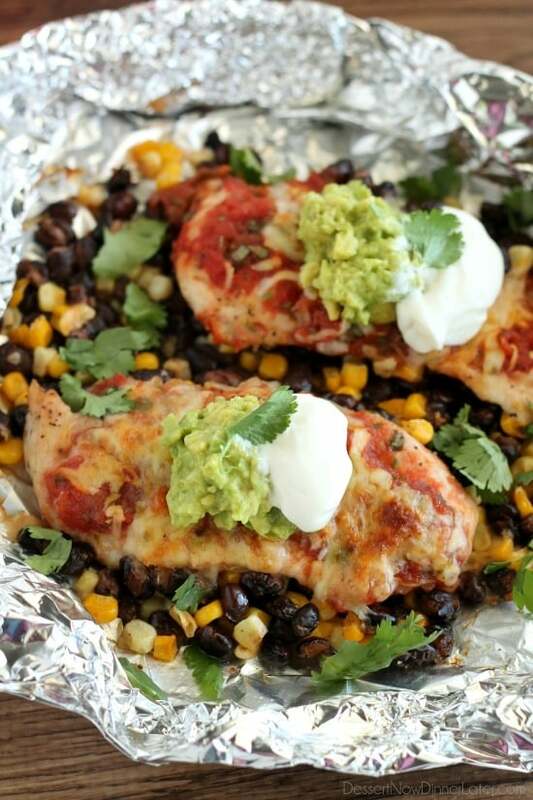 : Easy, Tasty Tin Foil Meals. 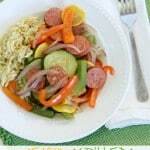 She has four mouthwatering categories of recipes to choose from: Breakfast, Main Dish, Sides, and Desserts. Just browsing the categories gets you hungry with her stellar photography. As I was flipping through FOILED!, there was one recipe, that I just had to try right away. The Southwestern Chicken Packets had my name all over them, but I didn’t have plans to go camping anytime soon. 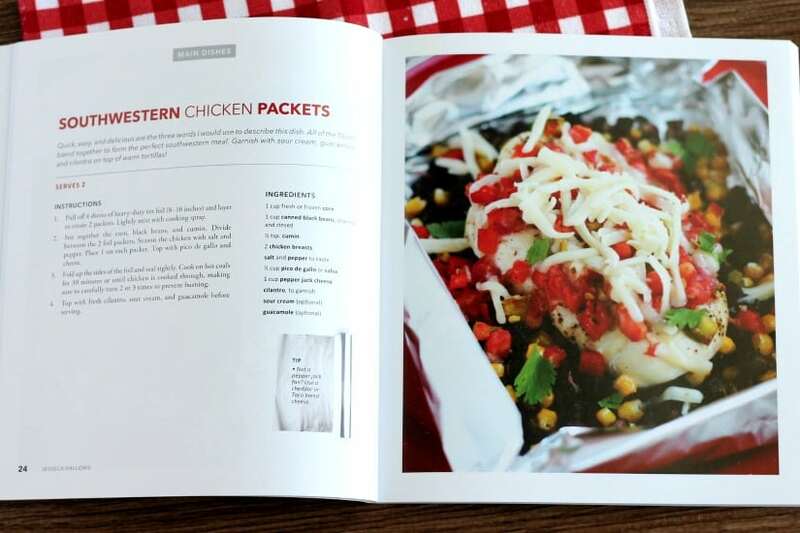 Lucky for us, Jesseca shares ways to make all of the recipes in her book with coals (briquettes or campfire), a gas grill, or a conventional oven, so I made these southwestern chicken packets in the oven and they were perfection! First things first, Jesseca’s recipes are easy! You literally toss it together, cook, and eat! I love a good no-fuss meal! This one reminds me of chicken parmesan, but Mexican style, so I just slightly altered her recipe and used taco seasoning instead of just cumin in the beans and corn. So yummy! I didn’t have to turn my packets in the oven since the heat is 360 degrees, and I opened the foil the last 10 minutes to brown the cheese. We are so ready to make these again, like tomorrow! These are going on the regular menu! 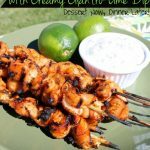 So whether you camp or not, you have to try this recipe! It’s amazing! Pick up a copy of your own FOILED! Cookbook on Amazon today! 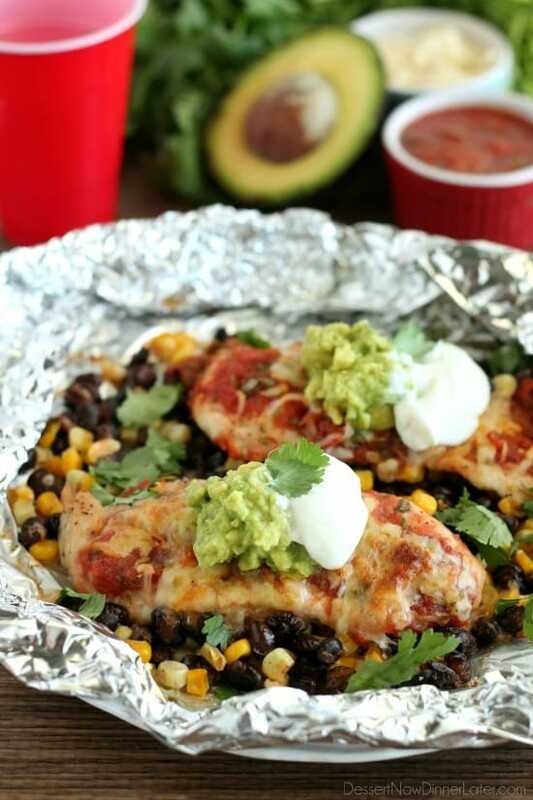 These Southwestern Chicken Packets are an easy and delicious no-fuss dinner recipe you can cook with a fire (while camping), on a grill, or in an oven. Pull off 4 sheets of heavy-duty tin foil (8-10 inches) and layer to create 2 packets. Lightly mist with cooking spray. 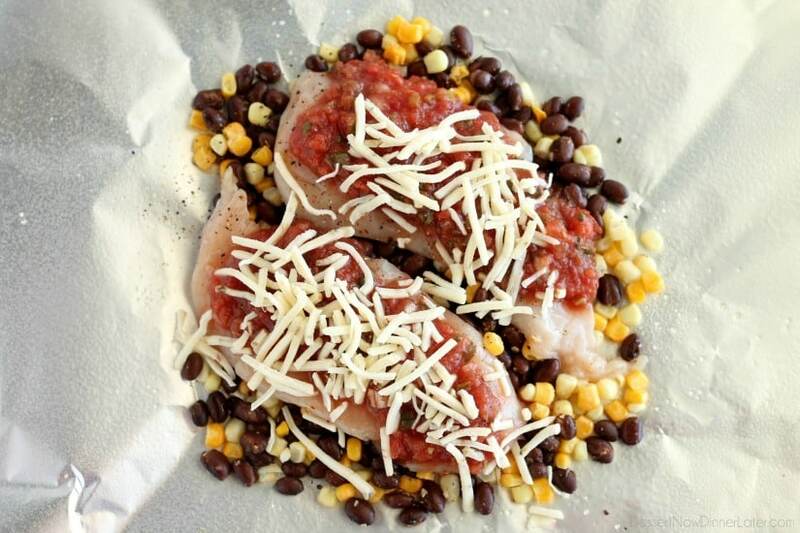 Stir together the corn, black beans, and taco seasoning. Divide between the 2 foil packets. Season the chicken with salt and pepper. Place 1 chicken breast or 2 chicken tenders in each packet. Top the chicken with salsa and shredded cheese. Bring the two longer edges of the foil together above the food. Fold the edges down twice, creating the top seal. Press the side edges together and fold, creating a secure packet. Top with fresh cilantro, sour cream, and avocado before serving. 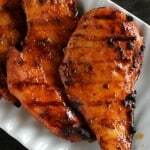 *If cooking on COALS make sure to carefully turn the packet 2 or 3 times to prevent burning. **If cooking on a GRILL make sure to carefully turn the packet once, about halfway through the cook time to ensure even cooking. Now, for the giveaway! 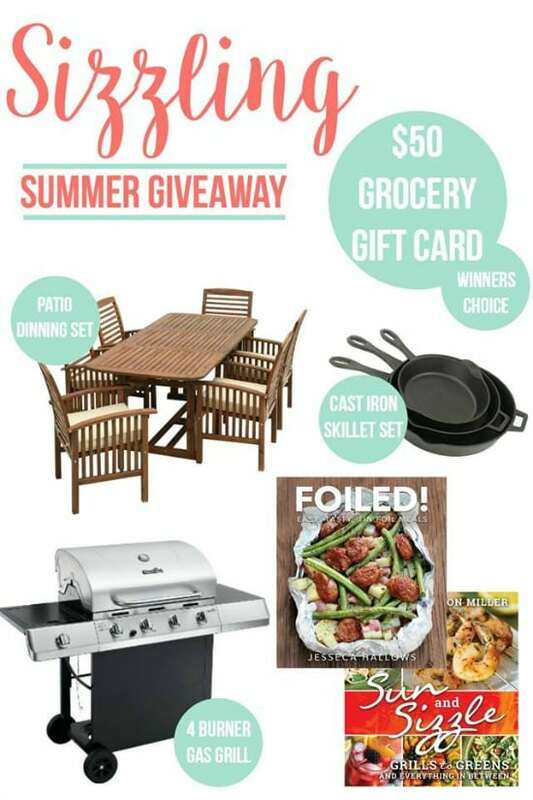 One lucky winner will get this amazing summer prize pack! These look so amazing Amber (and Jess!) I think they need to be the recipe I try next! YUM! Thanks Aimee! You MUST try it! We are making it again soon! These were one of our favorites! 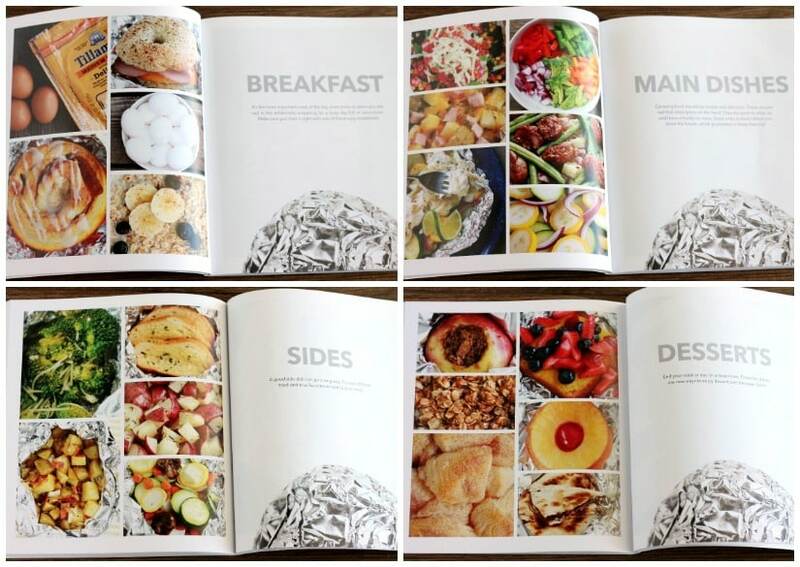 The photos look amazing and I am so happy you could fit my book in for a review! I was happy to! Love you Jess! I hope your book sells well! My husband was really excited about it! And we are having these for dinner again this week! Haha. Thanks for sharing, I am a busy working mother and always looking for new ideas. Will be trying this tomorrow. Intimidated by campfire cooking too, will be purchasing the book for sure also. I hope you love it Jonelle! And I’m happy to hear you will be buying the book! Jesseca (the author) will be thrilled! I love foil packet meals! I know this would be a hit with my family! Thanks Jessica! It is a great dinner! Made these last night… just wow. My salsa was a bit hot (perfect) and it made for great chicken and corn. Hi Randy! So glad you enjoyed this recipe! Thanks for your comment! Is there any reason I couldn’t use canned corn (drained) for this recipe? The corn may overcook and shrivel, but you can try it.